A very challenging and bloody top-down shooter. Great music and aesthetic af visuals make this worth playing through at least once. One of those games that I want to enjoy but I don't. I like its style but I get bored playing it. Great 80's style and the weird as hell story is effectively compelling and even creepy when it wants to be. Gets bonus points for having my favorite video game soundtrack ever. Game is fast and brutal, soundtrack is a perfect 100. Incredibly challenging at times but it's such a wild story and 80's feel that it's worth plowing on. 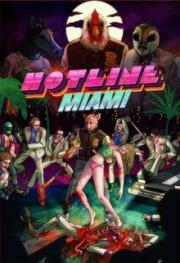 Hotline Miami is a weird developer (cactus) finally making it. The story is sufficiently weird and full of violence, but this is actually a rather intelligent game. The shoostin' plays out more like a chess game, having to plan your next move before you enter a room. On the surface it just looks like a gory top-down shooter but dig deeper and there's some depth here. At times confusing and punishingly difficult, It's surreal Lynchian storytelling, great soundtrack, and rad retro 80s aesthetc, defintely make it a unique experience worth checking out.